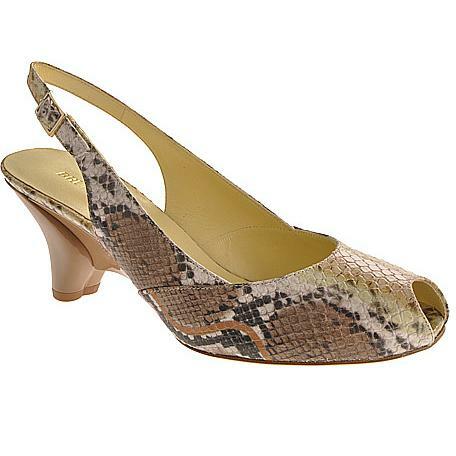 Enchanting peep toe slingback in stylish Snake skin print. Has an edgy look that will dress up your skinny jeans or compliment any dress look. Bruno Magli was founded in Bologna, Italy in the 1930’s when three siblings, Marino, Maria and Bruno Magli were taught the art of shoe-making by their grandfather in a small basement. In 1936, the siblings transformed their basement factory into a small business, otherwise known as The Magli Shoe Factory (Calzaturifico Magli). Propelled by the “Made in Italy” craze, Bruno Magli quickly became a leader in design, fabrication and commercialization of high-quality fashion shoes and became a major competitor in the Italian footwear market. In 1968, headed by the second generation of the Magli family, Bruno Magli moved to its current headquarters in Bologna at via Larga 33. Bruno Magli has since successfully maintained its position as a leader in the footwear industry by retaining the traditional values that have made it the prestigious Italian luxury brand since the 1930’s.